Postilion, a subsidiary of S1 Corporation, delivers integrated solutions and campaigns for self-service banking and payment processing. They serve customers on five continents, in more than 50 countries. The company needed an advertising campaign that would attract attention and interest from former and current clients. Specifically, the campaign needed to increase enrollment in shared advertising campaigns among S1’s financial institution client base. The goal of the campaign was to help Postilion’s financial institution clients increase enrollment of Internet Banking and Bill Pay services. This is an integrated, back-to-school campaign with cookie recipes and ideas for banks to hold cookie competitions within their customer base. The campaign consists of a branch poster, statement stuffers, point-of-purchase display with rack brochures, roll-over banner ad, exit banner ad, web landing page with cookie recipes. The Relax! 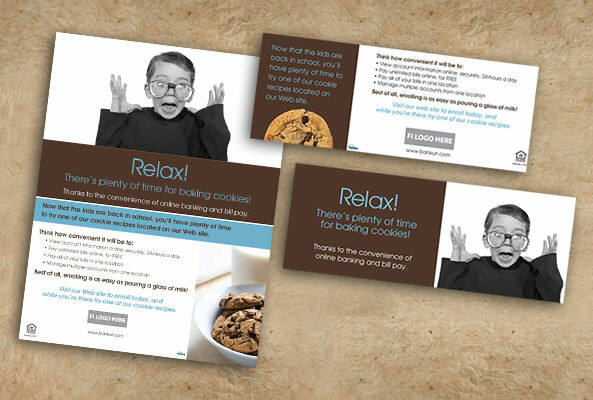 campaign received increased end-user response rates to the cookie recipes for all of the financial institutions who enrolled in the campaign.